When Howickian, Wally Rice, learnt that an intake of young children were to have respite care during the school holidays at Stand Children’s Services, Children’s Village, he immediately thought of John Rew, puppet man extraordinaire. John, who grew up in the Bucklands Beach area, has been playing with puppets since he was eight years old. He subsequently developed a passion for creating and making his own marionettes (string puppets) and has been entertaining children with his ever-growing assortment of puppet characters for more than 50 years. John works with an open stage so that the audience can clearly see him working the marionettes whilst using voice-overs to match the characters he has created. The children quickly focus on the puppets only and interact directly with them. Pene Frost, regional manager of Stand Children’s Services, formerly known as the Pakuranga Children’s Health Camp, and the staff were delighted with the response of the children who not only watched and interacted with the puppet show but also became actively involved in working the marionettes after the show. Even the most withdrawn child was persuaded to participate and came to the front to entertain the other children by manipulating the puppets. 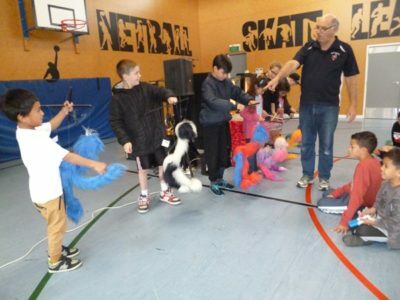 Some 30 children aged five to 12 years together with Pene and staff, Wally and Phil Rice and local children’s author Marilyn Bakker, were enthralled with the fast-paced show and the many puppet characters including elephants, performing circus clowns, acrobats and a giant teddy bear. The Pakuranga Children’s Health Camp, as the service was previously known, has been operational since 1948. The mission rests upon improving child and family/whanau health and well-being in New Zealand through the provision of residential and community-based services. The facilities include an educational facility, a residential, recreational and administration building for children, accommodation for parents, and an administration building. Stand Children’s Services partner with families and community stakeholders to support, maintain and enhance our most vulnerable children’s lives within their homes, schools and the communities they belong in.